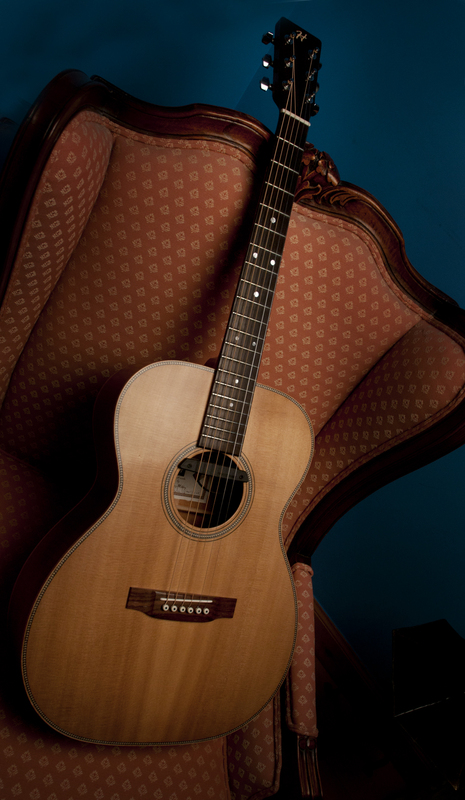 The Bruce is a true traditional Grand Auditorium acoustic guitar custom built to suite the individual. It comes as standard with solid mahogany back and sides. Spruce top with curly maple bindings, black and white herringbone purflings and rosette . Mahogany neck with traditional dovetail joint. Scale length 25″ 3/8”. Indian rosewood fingerboard, bridge and headstock veneer (maple inlay).Bracing sitka spruce, kerfing spruce/mahogany. Bone nut and saddle. Chrome enclosed Gotoh tuners. Hand finished with either wax or a water based lacquer. As with all my guitars the emphasis is on “custom built” which means I can create the guitar you want to suit your particular needs e.g. nut width; neck profile; tonewood choice; bindings; purflings etc, etc. Another feature I specialise in is to incoporate a particular piece of timber which is of importance to you as say the headstock veneer or end graft. So, when completed your guitar will be a “one off” made specially for you. This style suites all types of player, with its 1″ 3/4″ wide nut, it is well suited to the fingerstyle player as well as being a perfect all rounder.